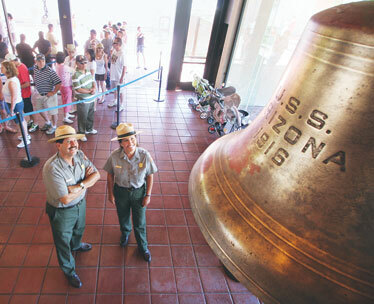 A bell rescued from the sunken battleship USS Arizona towers over park historian Daniel Martinez, top left, and Chief of Interpretation Eileen Martinez, as visitors wait to enter to the memorial. You can celebrate the Fourth of July in the usual way, with sizzle and bang, or perhaps this year you can chime in. At exactly 8 a.m. Hawaii time on the Friday holiday, the ship's bell from the USS Arizona will be rung 13 times, each chime dedicated to one of the 13 original colonies. More than 10,000 bells across the country will ring at the same time. One could be yours. The event is called Let Freedom Ring. The USS Arizona's bell -- one of two rescued from the sunken battleship -- will have its clapper reattached and rung by Pearl Harbor survivors. "In 1963, Congress passed a joint resolution asking that bells be rung in commemoration on the Fourth," explained Eileen Martinez, chief of interpretation at the memorial. "Friday, the Arizona bell joins thousands of others across the country. All are synchronized with the Liberty Bell in Philadelphia, which will be rung at 2 p.m. Eastern. If you have your own bell, get involved!" After ringing the bell, survivors will speak about their experiences during the Day of Infamy and afterward, "reminding us of the true costs of freedom," said Martinez. There is also an unusual exhibit, courtesy the National Pearl Harbor Survivors Association, of special-edition Pearl Harbor license plates from across the land. "On July 4, 1776, the Liberty Bell in Philadelphia rang 13 times to tell people that the 13 rebellious colonies had severed their ties with England, then signed the Declaration of Independence and created the United States of America," said Martinez. "The National Bell Ringing ceremony is a re-enactment of this event." Amid the barbecues and fireworks, "we sometimes lose touch with the true meaning of this day," said Martinez. "The right to life, liberty and the pursuit of happiness was not taken for granted by our Founding Fathers and it is just as precious today." » Aloha Tower Marketplace: 9 p.m. Thursday. Participating restaurants will offer seating for optimal viewing. Entertainment starts at 5 p.m. and features Jake Shimabukuro, fashion show, more. Call 566-2337. » Ala Moana Beach Park: 8:30 p.m. The show, launched from three platforms, is among the 25 largest in the country. Free seating available on Ala Moana Center's makai-ewa parking deck. Free musical entertainment begins at 2 p.m. at CenterStage, continuing at 5 p.m. on the parking deck. Visit www.AlaMoanaCenter.com. 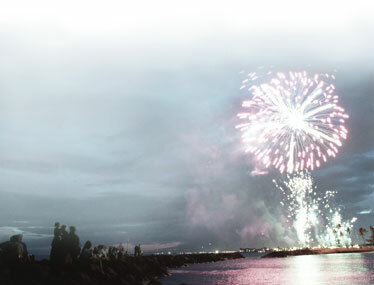 » Hawaiian Waters Adventure Park: Konishiki Kids Foundation presents Ohana Day, which culminates in a fireworks display. Kids' activities, entertainment at the wave pool and use of all water rides from 10:30 a.m. to 9 p.m. Tickets are $35. Call 674-9283, ext. 104. » Kailua: At 8 p.m. on Kailua Beach with an aerobatics demonstration at 6 p.m. Call 261-2727. » Kaneohe Bay: At 10 p.m. as part of the BayFest 2008 at Marine Corps Base Hawaii. More fireworks at 10:30 p.m. Saturday and 10 p.m. Sunday. Visit www.bayfesthawaii.com. » Maunalua Bay: At 8 p.m. in Hawaii Kai. Parking and shuttle service available at Hawaii Kai Towne Center. Visit independencedayatmaunaluabay.org or call 395-0577. » Sills Field, Schofield Barracks: At 9 p.m. Highlights include free concert with Billy Ray Cyrus, tribal powwow, "1812 Overture" with live cannons. Festivities begin at 9 a.m. with a 5K run. Call 656-3157. » Turtle Bay Resort: At 9 p.m., or earlier depending on wind conditions. Free festival starts at 2 p.m., with entertainment, food and craft booths. Call 293-6000.